As can be seen in this flyer, the UN notes that water and sanitation services should not exceed 3% of a families income. 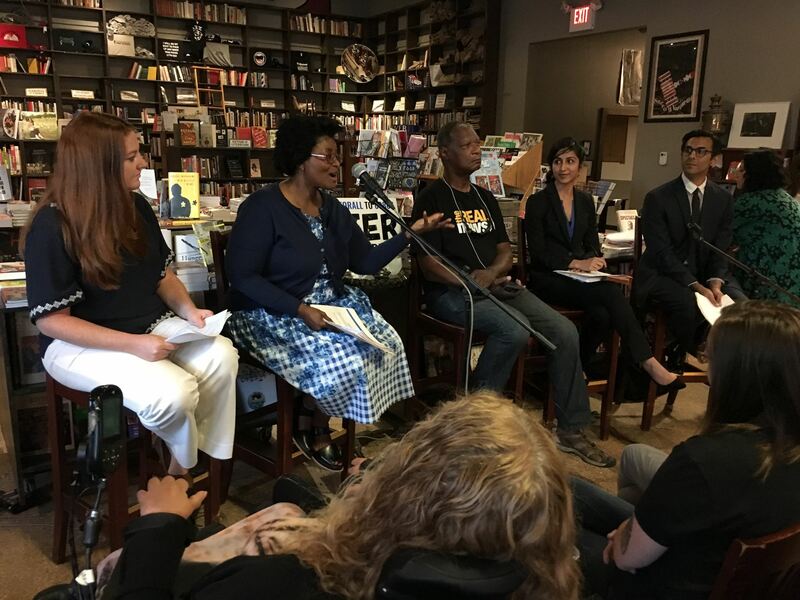 Here is the panel that spoke and the accompanying info from their FB page: Last night more than 160 Baltimoreans came to the Water for All: A Panel on Baltimore’s Water Affordability Crisis. 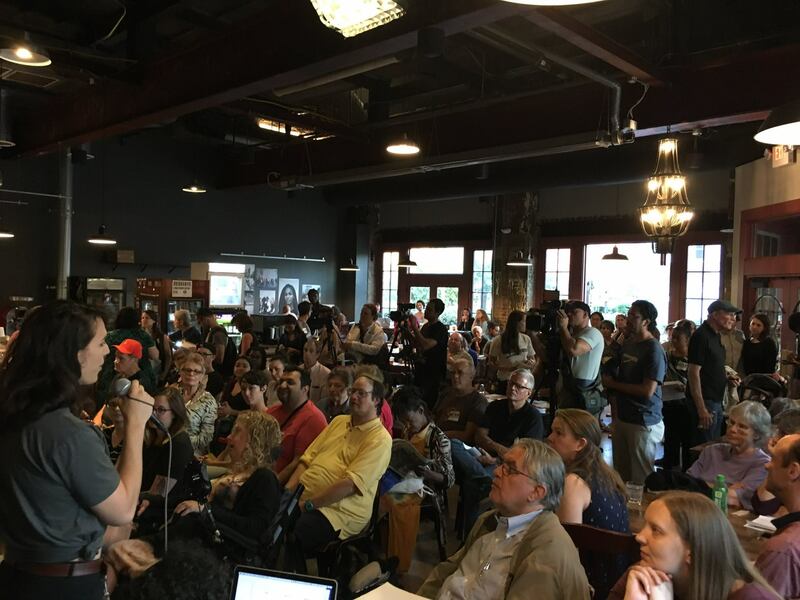 Thank you to everyone who came, to our coalition partners and panelists who made this event so powerful and to Red Emma’s Bookstore Coffeehouse for hosting! We look forward to working with everyone to ensure that everyone in our city has access to safe, affordable water! Because I did not know a lot of the information presented, I went to the UN website and looked it up. It is a lot to read and decipher: “The United Nations General Assembly passed and adopted the resolution on the human rights to water and sanitation on 17th December 2015. • Everyone is entitled “to have physical and affordable access to sanitation, in all spheres of life, that is safe, hygienic, secure, and socially and culturally acceptable and that provides privacy and ensures dignity.” I also found other resolutions from 2002 and 2012. The panelist talked about how people are losing their homes because they cannot afford their water bills (tax liens/sales) Rent, food and medication comes first. In Baltimore 2015 there were 5,301 water shut-offs. in 2016 there were 1,149. They did not explain the decrease in those numbers. One panelist brought up race and the affect this has on the Black Community. This affects everyone, not just blacks. These disproportionate numbers may come from their being more blacks in Baltimore? Population of Baltimore is 620,961 with 63% being black/African Americans. Which to me, brings up another point I was hoping to address but we ran out of time: If Baltimore’s Water Dept supplies water to 1.8 million people and only 600 thousand plus people live here – why aren’t the other peoples/counties carrying the brunt of these water bills? And the big corporations here should be paying more without those big tax write-offs! So as not to only express problems, they offered a couple solutions. The one I wasn’t sure what they meant so I won’t bring it up, the other is a fairly good idea: Baltimore should create an income-based billing program. And along with that, no one should lose there home over their inability to pay a water bill. The UN’s Universal Declaration of Human rights with Preamble and 30 Articles is a good read also. Wow! I had no idea that this was such a problem in Baltimore.